31.08.2016. Within the framework of the Vintage 2015 program, the government decided to issue 0.45 GEL per kg for Rkatsiteli grapes, 0.20 GEL per kg for Saperavi and 0.45 GEL for one kg of Kakhetian Green as subsidies. The highest price is on Mujuretuli/Aleksandrouli grapes with wine factories having to pay 2 GEL per kg within the state subsidies program. The statement was made by Georgia’s Minister of Agriculture Otar Danelia at the opening of the Vintage 2016 harvest coordination center in Telavi, Kakheti Region. The event was also attended by Deputy Minister of Agriculture Levan Davitashvili, head of the National Wine Agency Giorgi Samanishvili, and representatives of local government and wine producing companies. 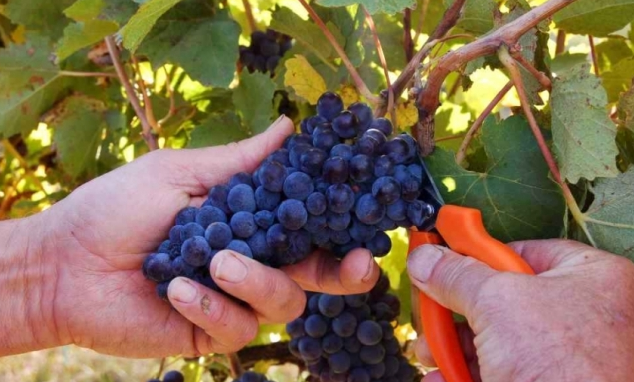 Danelia spoke about the importance of the subsidies from the state, adding the decision was made considering the interest of viticulturists as well as the interests of winemakers. 31.08.2016. 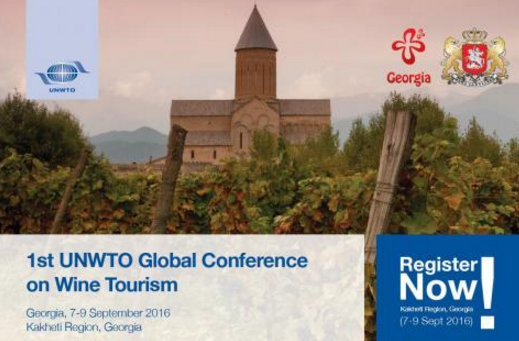 In a few days Sue and I will be jetting off to the Republic of Georgia for the first United Nations World Tourism Organization Global Conference on Wine Tourism.We have been trying to learn all we can about Georgia and its wine and wine tourism industries in preparation for the trip. I thought you might be interested in three of the resources we have found especially useful. 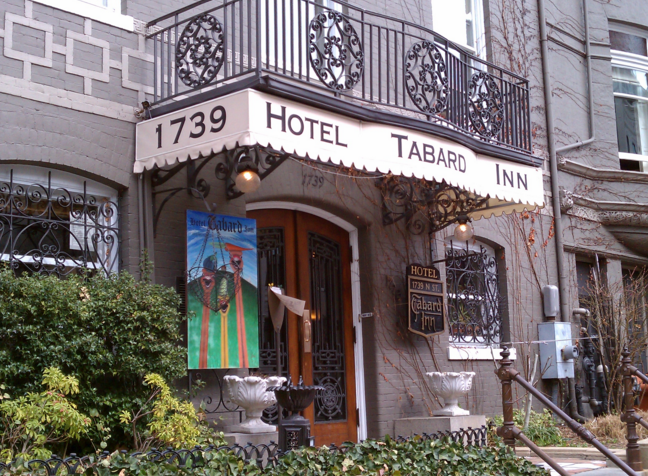 Taber had a great time in Georgia, the “Cradle of Wine,” 8000 vintages and counting. He loved the people and culture and was fascinated by the wine, reporting on the traditional wine-making process using big clay jars called qvervi (which are buried in the earth as shown below) to ferment and store the wine until ready to drink. 29.08.2016 (Hvino News). 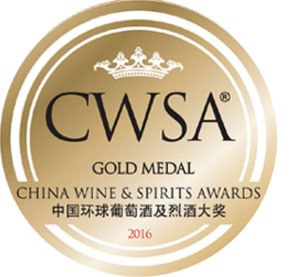 Ten wines from four Georgian producers were awarded at China Wine & Spirits Awards (CWSA) 2016. Georgian wines won 6 gold medals, 2 silver and 2 bronze awards. This is a serious progress compared to last year's results, when Georgian products won only 3 medals. 24.08.2016. (Hvino News). Please join us for a Georgian wine tasting and dinner conversation with Janet Cam, Janet Cam Consulting, LLC and Noel Brockett, Director of Operations and Sales, Georgian Wine House. The Republic of Georgia is considered to be the birthplace of wine – with supporting archaeological evidence dating back to 6000 BC. But is there more than pure historical interest in this fact? Indeed! 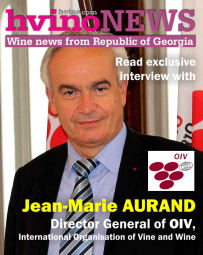 An ancient Georgian winemaking technique unearthed by the archaeologists has become a passion once again, in modern Georgia: the qvevri method, recognized by UNESCO as the oldest winemaking tradition on the World Heritage list. These natural wines made with wild airborne yeast have a cider-like nose and oxidized taste reminiscent of sherry. 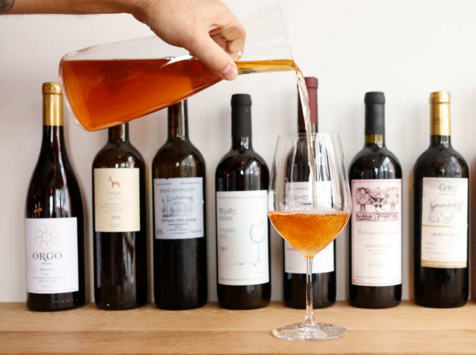 Though the method is rooted in ancient Georgia, modern winemakers around the world have now created an “amber/orange” wine trend, a renaissance of white wine vinified with skin contact which first took place with the use of qvevri. An example of amber wine is available on our wine list by the glass. 19.08.2016. 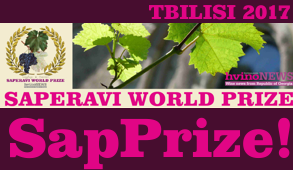 The main thing you notice about Mariam Losebidze’s 2014 Tavkveri is that it tastes like it’s infused with smoked fat. This is wine, albeit obscure wine, and wine tends not to taste like bacon. But Losebidze is one of only a handful of female winemakers from the country of Georgia — the former Soviet republic sandwiched between Russia and Armenia’s northern border — and her wines are unapologetically bold. They were also, until recently, largely only available in her home country. But now some of America’s most progressive importers and sommeliers have turned their attention to Georgia, which produces wines that are unlike anything else. Just as you might expect, plenty of Georgian wine is a far cry from grand cru Burgundies or the Pinot Noirs of California. For Western palates, much of it can seem, frankly, weird. In a lot of ways, the growing appreciation for Georgian wine is an extension of the continuing demand for so-called natural wines, the catchall term that refers to wines made with minimal processing, resulting in unpredictable, rustic wines where the makers — as opposed to the grape or region — are often the focus. Even the most hard-core natural-wine geek will still find a lot to unpack when digging into Georgia’s wine culture, which is 8,000 years old. There are, after all, some 525 indigenous grape varietals, about 50 of which are commonly used in commercial production. That means drinkers will have to familiarize themselves with grapes like Rkatsiteli and Kisi. 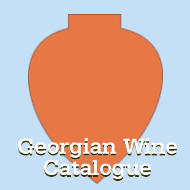 Georgia is also best known for wines that are aged in qvevri, traditional clay vessels that are sealed with honey and buried in the ground and can result in fresh, young wines that nevertheless have a dense, chalky texture. 18.08.2016. Wine producer Teliani Valley JSC plans to increase chartered capital for the second time this year. Company’s announced capital is planned to grow by 12 million shares up to 400 million. Nominal value on per share totals to 0.01 GEL. In addition , a preemptive right is scheduled to be abolished on the issued shares, provided that without the decision of shareholders, emission price of newly issued shares should not be less than the price set by the last public offering. The issue should be discussed at the shareholders meeting of Teliani Valley, which should be held on September 6. To remind, Teliani Valley has announced about attraction of 13 million USD late in July. The company placed 200 million pieces of shares with voting right, which was purchased merely by the shareholders. Nominal value on per share was 0.065 USD. Firebird Republics Fund – 8.82%. It is known, that the company is building a beer plant, and the funding will be used for that project. According to preliminary estimation, total project value (excluding VAT) amounts to 37 million USD. “Heineken”, “Amstel” and “Krushovitse” beer brands will be produced in the plant. 14.08.2016 (Hvino News). 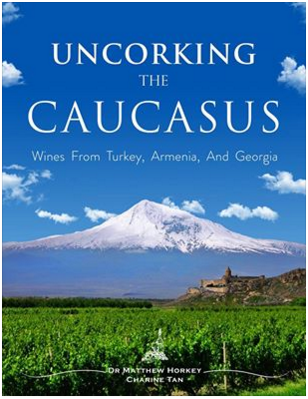 Uncorking the Caucasus: Wines from Turkey, Armenia, and Georgia - is a new book by Matthew Horkey and Charine Tan, to be released in September. Based on the authors’ three-month wine travel trip through the Caucasus, this book takes a ground-level approach, which enables the readers to experience an intimate journey through the cradle of wine. Part travel narrative and part wine guide, this book will take the readers on a tasting tour through the wine regions in the three countries, recommend the best wines each place has to offer, provide anecdotal insights into the wine culture of each country, and discuss the history of ancient winemaking based on archeological evidence. Turkey, Armenia, and Georgia all claim to be the birthplace of wine. “There are many arguments about the origin of wine; from an archaeological perspective, the signs point to about 8,000 years ago in the Transcaucasia —which includes present - day Armenia, Georgia, and Turkey”, - the authors point out. 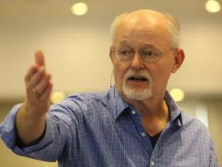 Some of those claims are supported by archaeological ﬁndings and some by anecdotal evidence. However, this book isn’t about determining the birthplace of wine, but rather the goal is to capture the ethos of a wine region—that is the connection between wine, people, and place. Publisher: The Blue Roster Private Limited, Singapore. 13.08.2016. Georgia is about to send a large cache of traditional wine to China. In the coming days Georgian wine company Madloba (‘thank you’ in English) will export about 300,000 bottles of Georgian wine to the Asian nation. 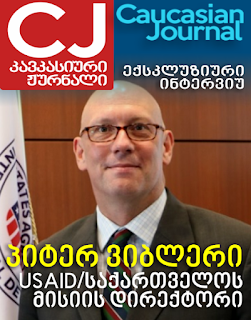 The large export is possible thanks to assistance from the Entrepreneurship Development Agency (Enterprise Georgia). Madloba will also organise several international wine exhibitions in China to raise awareness of Georgian wine. The Madloba wine will be sold at eight different wine houses in China, said a company official. In recent months Georgia has focused on expanding its wine exports to China. Already more than a dozen wine houses featuring wines from a range of Georgian companies have already opened this year to solely promote the Georgian drink. 13.08.2016 (Hvino News). Explore the viticulture of the country of Georgia, the Cradle of Wine, where wine-making traditions go back more than 8000 years, and today there are over 500 distinct grape varietals still grown. Join us to taste through a tremendous lineup of diverse bottles of white, amber, rose, red, and dessert wine, from high quality producers using both European and traditional local methods. 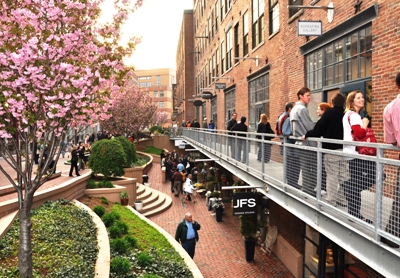 The evening will feature wines from the portfolio of an exciting new Massachusetts-based boutique importer focused exclusively on the country, Georgian Toast, and takes place in the swanky setting of one of the hot new galleries of Boston's South End, Matter and Light Fine Art Gallery. Food pairings, including some authentic to the region, will be provided. All ticket holders receive a commemorative tasting glass that is theirs to keep. Join us to experience the real deal: fine expressions of indigenous varietals (most notably Rkatsitelli and Saperavi), some from old vines, some organic or bio-dynamic, selected for their excellence from smaller, quality-focused producers. 11.08.2016. 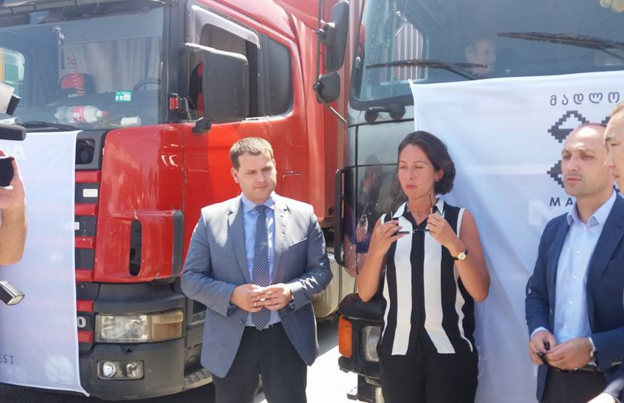 10 containers loaded with Georgian wine were registered in the Tbilisi economic zone today. The products are intended for Georgian wine houses in China. The Georgian Wine House is a joint venture of the Georgian Tbilinvest Group and the Chinese Suolun company. The event was attended by Deputy Minister of Economy and Sustainable Development Genadi Arveladze, Georgian Deputy Minister of Agriculture Levan Davitashvili and President of Georgian Chamber of Commerce Nino Chikovani. As Nino Chikovani said, 10 containers will be exported at this stage and the process will continue, as the Chinese market is very important for Georgian exporters. Davit Ebralidze, head of the Tbilinvest Group, said that 50 Georgian wine houses are planned to be opened in China within one year and 2 million bottles of Georgian wine will be exported. “The first Georgian Wine House was opened in the city of Yu in July 2015. Georgian wine soon become popular and we are going to open many more such houses in different cities of China”, he said. 10.08.2016 (Hvino News). According to Georgia's National Wine Agency data, for July 2016, 23 932 067 bottles (0,75 l) of wine have been exported from Georgia to 44 countries worldwide. That is 42% higher than last year. 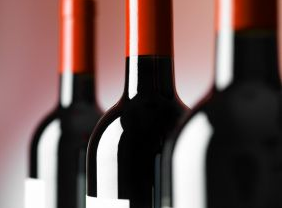 In the period under review, 55,3 millionUSD worth of wine has been exported, that is 16% higher than last year. In the period under review, growth is remarkable in the EU countries, in China and other traditional markets: China - 152% (2 475 557), Belarus -122% (575 166), Ukraine - 72% (2 595 947), Russia - 50% (12 748 273), Poland-29% (1 190 926), Estonia - 57% (379 650), Kyrgyzstan-107% (163 966), Germany-21%(174 166), Japan - 12% (1 011 448), Czech Republic - 542% (76 988), UK - 44% (58 618). The first five of the exporter countries are as follows: Russia (12748273), Ukraine (2595947), China (2475557), Kazakhstan(1924046) and Poland (1190926). 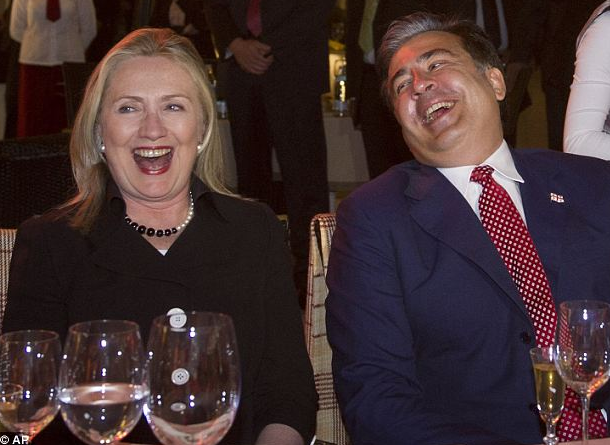 As it has been reported, before Mrs. Clinton sampled this wine, its price was only 25 Georgian Laris, but today it costs several times more – 600 GEL. This fact has become the source of many jokes. People say the price will be even more if Hillary Clinton becomes President. 05.08.2016. An Iranian investor is building Green Village in Georgia’s historic winemaking region Kakheti, creating a unique destination for tourists and tourists that will bring money into the region and benefit the country’s economy. In particular ARIC LLC concentrated in agriculture, eco-tourism, the food industry and construction businesses and seeked to export harvested goods outside Georgia, including EU markets. 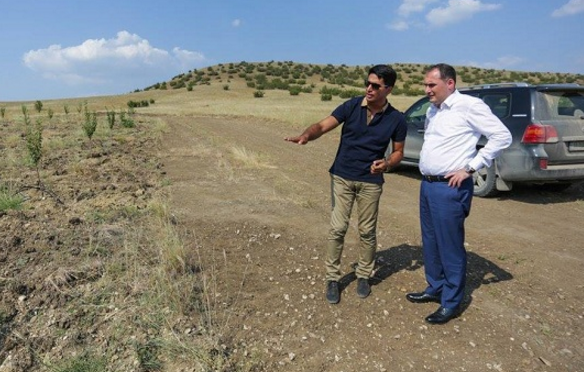 ARIC LLC has already invested about $85 million USD to develop the area in Kakheti. 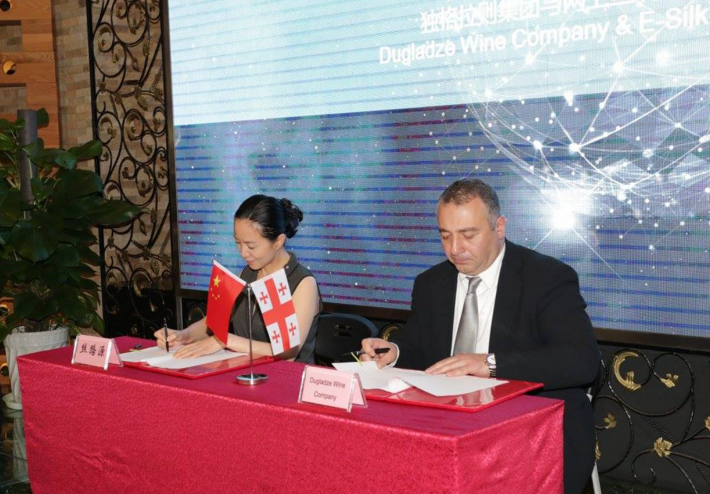 Georgia’s Economy Minister Dimitry Kumsishvili and representatives from Dugladze Wine Company signed the agreement in Shanghai at a promotional event, The Summer of Georgian Wine last week. The agreement will see the launch of the E-SilkRoad website which will sell exclusively Georgian wine to China, which is currently Georgia’s third largest wine importers, according to Georgia’s Ministry of Economy. 02.08.2016. This year, Georgian companies exported 1.1 million liters of brandy to Russia. Thus, Georgia became number one brandy exporter in the Russian Federation. 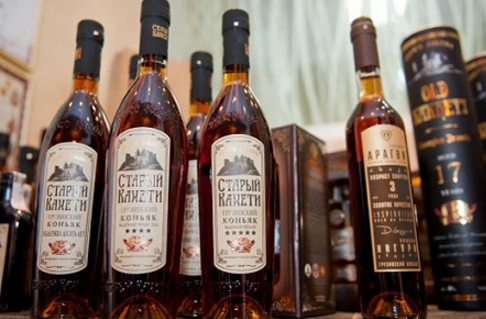 Georgian products take 48.1 percent of the imported brandy/cognac market. A year ago Georgian producers covered only 20 percent of the Russian market where France completely dominated. Exporting of Georgian brandy to Russia was restored in 2013 after a seven-year unstated embargo introduced by the Russian government in response to a series of confrontational steps by Tbilisi, including an arrest of four Russian officers for espionage in 2006. Moscow stopped importing not only cognac and wine, but all agricultural products. Cooperation in the trading sphere was restored only after a change of power as a result of the parliamentary elections in 2012 – a victory by The Georgian Dream of billionaire Bidzina Ivanishvili. The most popular brandies in Russia are Old Kakheti, The Heart of Aragvi [brands of KTW], and Sarajishvili. Their average price is 400-600 rubles per bottle, while French cognac got up to 3000 rubles. It is interesting that Georgian brandy producers complain to the ruble falling less than others. 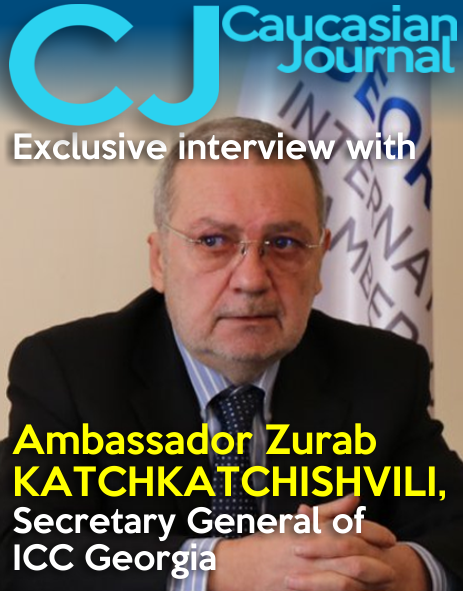 Sometimes they make it clear that being a part of the post-Soviet space, traditional Georgian industries are better adapted to a new ruble course than producers from non-CIS countries. 01.08.2016. People in China with a taste for Georgian wine can buy their favourite tipple from a number of new Georgian Wine Houses but soon consumers will be able to go online to buy their favourite drink. A special platform named E-SilkRoad will launch online where traditional Georgian wine will be sold in China. 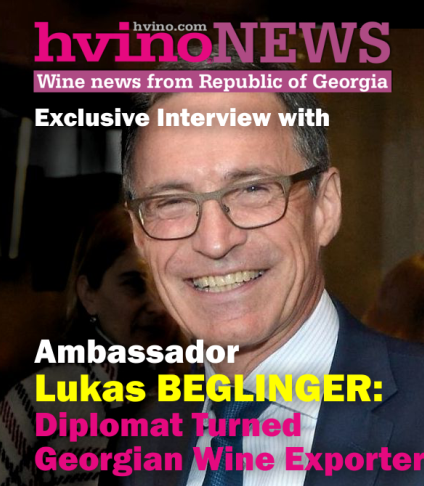 The first Georgian wine company to sell its wine on the E-SilkRoad website will be Dugladze Wine Company, which will initially export 300,000 bottles of wine for online purchase. Today Georgia’s Economy Minister Dimitry Kumsishvili and officials from Dugladze Wine Company signed corresponding agreements in China’s biggest city Shanghai. The agreement signing ceremony was held at a special event named The Summer of Georgian Wine.